I think it was a Friday night in early March when we took off. Finished work at 5, or maybe an hour early, or maybe it was the next morning? Either way, hit the bottleshop for some whiskey and caffeine from Timmys then headed for the hills. Its a long road ahead through the mountains. Up to Lake Louise, down the mountain pass round through the Yoho Valley and out through to Golden BC and the Columbia Valley. Id passed through here once years before on a Greyhound I recall. We grab some more coffee and treats then head on; another mountain pass this time through Glacier National Park awaits. The weathers fine, with a fair bit of moisture in the air though enough sun to burn through it and shine some warmth amongst the snowy mountains. Odd bits of snow and slush on the road as we move through the highest parts, but we make good time and arrive at Revelstoke a little later on. Been here before a few years back too oddly enough. We are have knocked off just shy of 290 kms at this this point, but now we must curve back around into the valley and down the Arrow lake to Nakusp. First though we are looking for some hot springs hidden up a logging road by St Leon. We drive 10km up a muddy icy logging road and here from some lovely canadian rednecks that its still another 5km in. We can’t make that in our Vehicle and don’t care to walk. We leave, not a big loss, try the next ones around the next mountain. Always have a back up hot springs! These we at least find a parking lot for – 2 cars pulled over on the side of the logging road where there is little space. We march off and…end up getting lost in hectic thick woodland on a steep hill for the next 45min. I have lead us the wrong way. We climb and clamber over thick fallen timber. Its covered in moss and is hard work. Eventually we make it to them from the opposite direction. The reward is worth it: we are semi naked in our own private 40c bath. Made of 3 clean rocks and steaming water that was dripping out under the moss covered tree. Whoa…nice. Theres actually 3 pool, but this gem sits just above the others. We drive a ways further, looking for a campsite. Many are closed and we move on, scope out the shore beyond Nakusp. We settle on Box Lake as our last option. Its perfect. One of the best campsites you could imagine. No one around, Enormous leafy trees amongst snow covered mountains by a lake. A small jetty with a lone chair floats nearby. Set up, fire going, drying wood and setting things to order. Order has been created. Get the whiskey. We wake covered in a world of snow. Theres a good 3cm covering the tent but we are cosy in our warm den within. Cold slushy snow now covers our world as we face the spawning day. Its amazingly beautiful but we quickly escape in the car and head on. Still a long way to go. We pass down through the valley to New Denver, then to Nelson where we dry in the sun by the harbour and sports field. Nelson is a dream of a place. A confluence of mountain lakes that are big enough to hold a small marina of boats. 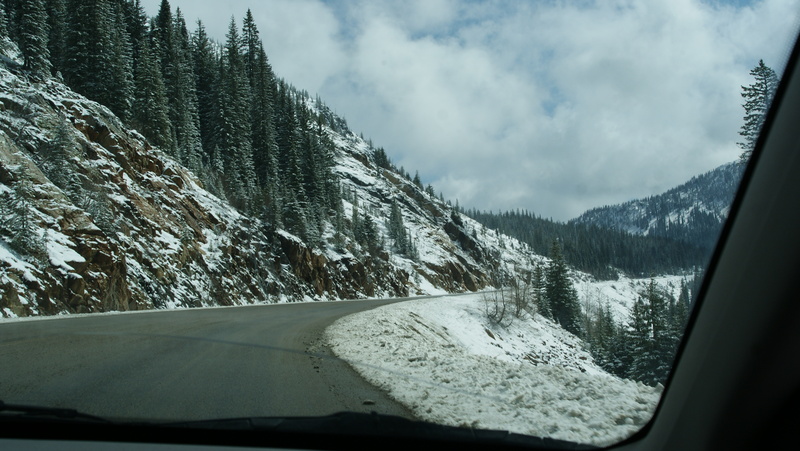 The day takes us further south, past the turnoff onto the US into Montana, as we finally turn back west, and for another mountain pass. 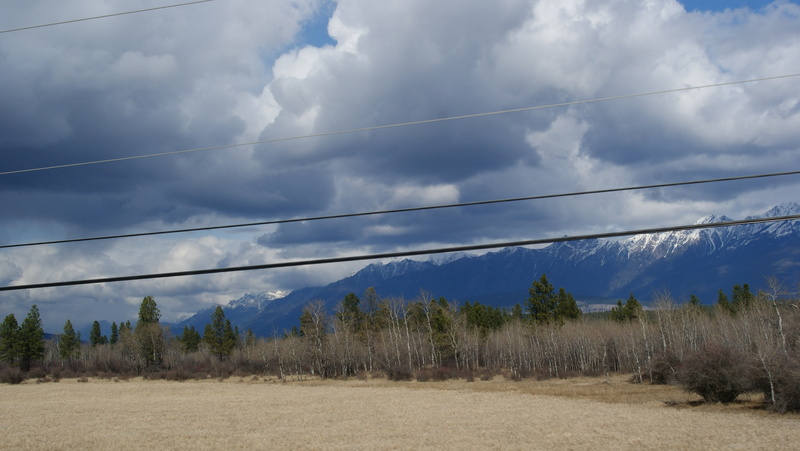 Its a stunning drive through the Kootenays. Smooth and with plenty of snow and sun. Epic views at every turn…they way the world should be. Down the valley and out to Castelgar. Another 300km back up through the Columbia Valley and to the familiar 93 past Radium and into the 4th mountain pass of the trip. From the bright sun and warmth of the low flat Columbia, we are now back in a mountain snowstorm. 50km an hour now with a procession of traffic, full headlights with maybe 100m visibility. Rough. The car swerves on a berm of snow. Plows belt past in the opposite direction. Parks Canada doing some good. It breaks, and we drop back into the mid Bow valley at Castle Mountain Junction before Banff & home.